A long time ago a little rabbit lived on top of Red Rock Hill. He had thick grey fur and a white necklace around his neck, like a collar. His favorite food was Prickly Pear. Little Rabbit loved its sweet juicy taste. 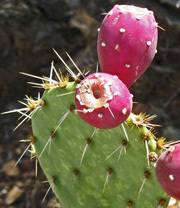 Prickly Pears are delicious on the inside, but have spines on the outside that can stick into you and hurt you. Little Rabbit knew how to eat Prickly Pears without getting spines stuck in his nose. All day long he hunted for the fruit along the east bank of the Rio Grande River. “Mmmmm” said Little Rabbit as he ate another Prickly Pear. “This tastes so good. This is my favorite, favorite food!” Every day he slowly hopped along the river bank with his head down, eating and eating. He hadn’t been stuck by spines. It was worse than that. He looked around him, up and down the river bank, blinking and twitching his whiskers. “There are no Prickly Pears left!” He moaned. He had eaten all the Prickly Pears on that side of the river. Sad Little Rabbit sat on the bank looking at the empty grass all around him. Then he looked across the river to the west bank, and his hungry eyes filled with excitement. “I wish Uncle Fast Water who controls the river current could help me. He would take me safely across the river to eat Prickly Pears”. Little Rabbit leapt up and hopped to where the voice had come from. “Uncle Fast Water, you’re here,” he said. “Splish! Splash! Splish! Splash!” Uncle Fast Water moved through the water carrying Little Rabbit, and quickly reached the other side. “Call me when you want to return,” he shouted as Little Rabbit hopped onto the west bank. Then Uncle Fast Water flowed away, leaving lines of ripples behind him.